How do we integrate ( bind ) color and sound into a single moving object? These fully formed objects surf into our mind’s eye on waves of synchronized signals twixt transient coalitions of networked functional areas. This diagram shows many interconnections between the pathways involved. The green pathways represent vision. Starting with the retina at the bottom, the optic nerve connects to LGN; the optic radiation is bidirectional between LGN and V1 and then cortico-cortical projections between regions. Red paths are auditory nerves. 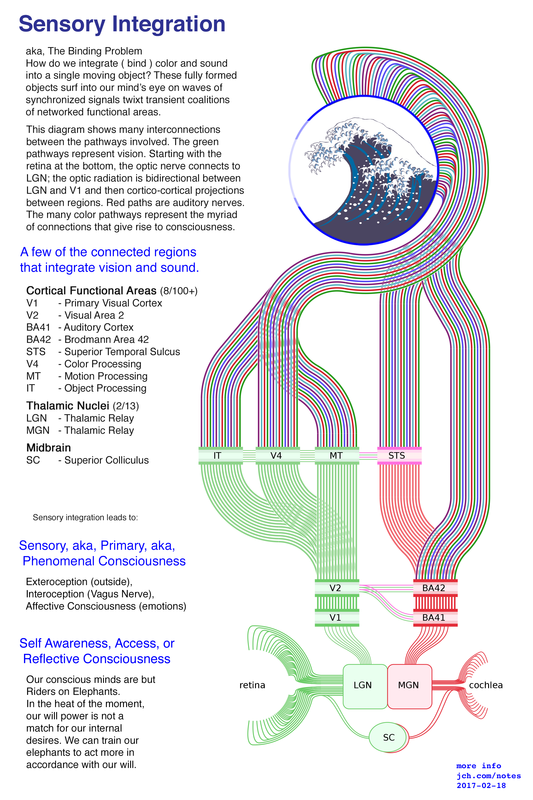 The many color pathways represent the myriad of connections that give rise to consciousness. that integrate vision and sound. Our conscious minds are but Riders on Elephants. In the heat of the moment, our will power is not a match for our internal desires. We can train our elephants to act more in accordance with our will.